Proper winterizing helps to protect your investment. Do It Right And It Makes Springtime Opening Easier. Improving The Success of a Pool Closing or Winterizing!!! Avoid the temptation of closing a dirty pool and putting off the clean-up, stain removal or sealing a leak, until next spring, for surely next season's opening will be more tedious and expensive, Clean the pool, balance the chemistry, remove stains and get ready to close. If a leak is present, it must be found and fixed. A Water Sweeper Broom makes cleaning the surrounding area easier and uses far less water, to wash away the debris. 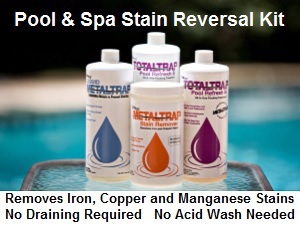 A Stain Reversal Kit contains everything needed, to remove stains caused by heavy metals. A portable, hand held, battery-powered vacuum is a convenient way to remove debris, from the pool floor. A ColorQ all-digital water tester eliminates the color-matching and guesswork, while performing all of the common pool test factors. Proper chemistry helps improve sanitizer effectiveness and reduce corrosion. 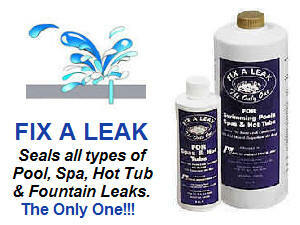 Fix A Leak is the easy way to seal small leaks, located most anywhere in the pool. Simple to use. You don't want to close a pool with a leak, that might be a simple fix. A Robotic, Solar-Powered Pool Skimmer/Cleaner works autonomously, from dawn to well after dusk, to remove floating debris, before it settles to the pool floor. How to close or winterize a swimming pool? Pool closing or winterizing refers to the steps necessary, to chemically treat the water and protect the pool and related equipment from the effects of freeze-thaw damage, during the inactive winter months. Proper winterizing protects your investment and can help make springtime opening easier and less expensive. Time spent doing a proper wintering job, will pay big springtime dividends. When winter comes . . . can spring be far behind? In some southern locations, the pools are left uncovered all year, even though they are not in year round use. Adding a solar-powered pool mineralizer and/or a salt chlorine generator can help provide better control over the water quality, during the less active months. Pool closing instructions will vary, based on pool type, equipment and the physical location. Check with the manufacturer and/or builder, as to what are the recommendations applicable to your pool type and area. If problems arise, refer to the Pool Problems Page, as a source of problem-solving information, broken down into various categories. Scroll down the page and click on the linked keywords, catch phrases or images, in the archived answers below, to access additional information, on that topic or product. ► Pool's Open But Not Used All Winter? This year we plan on keeping our pool open and uncovered all winter. It is too cold to use, but not cold enough to worry about freeze damage. If it gets cold enough to freeze, we will simply keep the pump running. This seems easier than going through the whole winterizing thing. We have a salt chlorine generator and plan on turning the setting down and cutting back on the pump running time. Is this anything else, that would help us avoid problems? Thank you. You should be OK, if you watch out for a forecast of hard freeze. There are two things, that can help make a difference. Use a Water Sweeper Broom to wash away leaves and debris, from the pool deck and adjacent areas. This will reduce the amount of wind-blown debris, that finds its way into the pool. Adding a floating solar-powered pool purifier will add another layer of algae control and help you get by, while maintaining a lower level of chlorine. This becomes even more important, when the hours of pump operation are scaled back. The solar-powered pool purifier will add copper and zincs ion for algae control, which will find their ways to all areas of the pool. Don't forget to test the water on some sort of regular weekly basis. The efficiency of salt chlorine generators drops along with the water temperature. When the water temperature gets into the lower 50's, you might have to supplemental the salt chlorine generator, with some standard chlorine products. I hope that this makes for a problem-free winter. ► Leaving A Solar Cover In Place, Under A Winter Cover? We purchased a solar cover this year for our 28 round above ground pool. Can we leave the solar cover on the pool after winterizing pool and then put winter cover on pool? Thanks in advance. That would serve no useful purpose. Winterizing doesn't always go as planned. Sometimes it ends up being a mess. Leaving the blanket on the pool will expose it to algae and mold growth, under the best of conditions. You are better off cleaning the cover and storing it for the winter. That will make one less thing to clean, next spring. Speaking of cleaning up, a Water Sweeper Broom is a great way to clean solar blankets and winter covers, as well as decks, patios and walkways. I hope that the information provided was helpful. Leaving a pool empty, for long periods, increases the risk of structural damage. I suggest covering the pool, as done in the past. Having a Salt Chlorine Generator will be a real plus, in helping to maintain the water quality. For refinishing ever consider using Ultra Poly One Coat? It is a hybrid-epoxy coating that is used in pools ands water parks all over the U.S. Preparation is simply a scrubbing with a citrus-based cleaner and a power washing. Acid washing is NOT recommended and no one likes to do that. I hope that the information provided was helpful. ► Avoiding Metal Stains Next Spring? I have an in ground fiberglass pool, that was installed 1986. When winterizing, what chemical can I add to help prevent staining, after opening the pool, next spring? Thanks. Some fiberglass pools can be stain prone, due to static electrical charges, on the walls. Liquid MetalTrap is a true chelating agent, that contains no phosphates and works over a wide range of pH. It complexes (chelates) iron, copper and manganese, which will help prevent staining, due to dissolved metals, over the winter. It is very stable and does not decompose to form phosphates, like many other products being sold. One quart will treat up to 1.0 PPM of dissolved metals, in 10,000 gallons of pool water. Add it after the water level has been lowered. If you source water contains metals, you might want to connect a MetalTrap Filter, to the garden hose, so that no new metals are added to the pool. I hope that this information provided was helpful. ► What To Do In Houston? I have skimmed through many of the questions you have answered on your website and other websites. It is so confusing. One will tell you one thing, while another will tell you the complete opposite. I live in Houston, TX. It is rarely below freezing here. January is typically the time of years it is below 35 degrees at night. So here is my question…. Do I just leave my filter pump running the entire time, even for days during the colder days/nights (32 degrees or below)? Tonight it is supposed to be 25 degrees. The rest of the week the lows will be 32-35 degrees. OR Do I lower my water levels below the skimmer and drain the filter pump? 16X32 Oval above ground pool, with a salt chlorine generator, PVC pipes and a 1.5 H.P. pump.. Thank you. I would not drain the pool. I would operate the pump, during those times when a hard freeze is possible. It does not have to be 24/7. As the temps move above freezing, you can just operate for a given number of hours each day. Just in case, put a 8' piece of a pool foam noodle in each skimmer. This is practical to do in Houston, but not something you would to in the frost belt. You still need to maintain some chlorine, to prevent the growth of algae. Your salt chlorine generator will not be able to do the job, while the water temperature is below 50° F. I am not sure that many pool dealers know this or take the time to point it out. To help prevent algae growth, during the less active winter months, a solar-powered pool purifier would help fill that need. It will work at reduced output, because of the shorter days, but will still release enough ions. And it is something that you can use during the swim season, as well. You should also clean the pool floor, on a regular basis. A battery-powered, portable vacuum would be the ideal way to make that an easy task. I hope that this will be helpful. ► Ready To Close And There's A Leak? My pool is ready to close, but I seem to have a small leak. If I close the pool with the leak, what risks do I run. Any suggestions? Thanks. Closing a pool with a leak it is not a good idea. You didn't mention the type of pool involved, but no matter which type, there are major risks. Walls can collapse or get damaged, covers can fall into the pool and the leaking water could cause undermining or erosion issues. Fix A Leak might be able to seal a small leak, as big as 1/8-inch in diameter and under 2-inches of loss daily. It about the easiest way to address the problem. In order to work, the water temperature needs to be at least 70°F. It can't fix every type of leak, such as cracked pipes or popped fittings, but is worth trying before you start digging. The next best option is leak detection. There are leak detection kits. that will help you locate the leak, using some high tech equipment. The are companies that specialize in leak detection, as well. No matter what, do something before closing, for best results going forward. Good luck. ► To Winterize Or Not To Winterize? Dear Alan, Oh why didn't I run across your website @ the beginning of the summer season? I have been reading your archives since 9pm. It is now 12am! It was so interesting and informative. I inherited my pool this year, when I bought the house. It is a 25k gal, vinyl liner with a sand filter. I didn't have a clue as to the care and maintenance of it, but I am happy to say that I learned from the pool dealers that installed it and I had a very enjoyable summer w/o too much trouble. I am writing you because I want to know about closing it for the winter. I live in Atlanta, GA. They say I don't have to cover it, it is up to me, as if I know what I want or what is best! What do you say. Also, one of those solar heater pads was left, can and is it used as a cover? As far as draining filters, covering ports and all that, I know I am going to need them to come and show me how as I am clueless as to where and how! One more question, how do I decide what brand of product to use? If I can just cross this last hurdle, learning about opening and closing the pool, I think I may even feel confident that I actually know what I am doing! Smile! By the way, the pool is only 1.5 yrs young. You really know your pool/chemical stuff and I thank you for all the knowledge that I gained tonight and any help you can give me concerning opening and closing it. P.S. I am throwing away my OTO test kit and getting one of the ColorQ Testers, that you suggested! Did I mention that it is an in ground? Thank you for the kind comments in your email. If I was living in your area, I would certainly cover my pool with a winter cover. To do otherwise, will leave you with a much bigger cleanup problem next spring. The solar cover cannot be used for winterizing and should be removed, cleaned and stored indoors for the winter. So far as choosing a brand, I suggest that you go with the brand that has your trust. There are dedicated Winterizing Chemicals Kits that are complete and easy to use. Proper winterizing will make springtime opening easier, while saving time and money. Many in your area take winterizing for granted and that is a mistake. You should take the necessary steps to protect your investment. The archives contain information on winterizing. If you are unsure about anything, I'm sure that a local pool professional will be able to help you with the finer points. I hope that I have been helpful. ► Winterizing An Uncovered, Salt Chlorinated Pool? It's our first winter with the new pool, saltwater inground gunite with plaster lining, sand filter, floor cleaning system. We live in northern TX, close to OK border. I'm considering trying to leave the pool running over the winter, I hear others in the area are able to do so. I'm confused as to some of the details - I will buy a timer to keep it running when it gets cold, but other than that, do I need to adjust the water level? How about chemicals? Our pool company has failed us miserably, didn't even tell us we should be cleaning the salt cell so we get no help from them. What other basic information might I be missing? What type of at-home testing kit do you recommend to check alkalinity, calcium, pH, salt, etc. I would like to lower the amount of times I need to run a sample into town to have it checked. I've seen different types of digital readout testing kits with strips, then there is the dropper kits, I would like something easy but reliable that will tell me how much and what I need to add. I appreciate any help you can give me, please. Thanks for your time. I think that you came to the right place. Leave the water, at its normal level. Make sure the filter is running, when below freezing temps are expected. You will have to maintain the chemistry, but as the water cools down, below 55°F, the salt chlorine generator may lose efficiency. You might need to add some traditional chlorine, but you should get by with 1-2 PPM of free chlorine. Check the pH, in case chemicals have to be added, as needed. If you add a Solar-Powered Pool Purifier/Ionizer, which releases copper and zinc ions, it will provide some backup sanitizing, in case the chlorine level bottoms out. No matter what, the Solar-Powered Pool Purifier/Ionizer will reduce the chlorine usage, all year long. Keep the pH at 7.2-7.6. If you do that the TA becomes less relevant. Make sure that the cyanuric acid level is around 50 PPM. There is no need to go higher. Maintain the calcium hardness at 200-400 PPM. You don't have to be in the middle, 200 PPM is fine. If you allow the pH to rise, calcium hardness over 400 PPM could present a problem. Vacuum as needed. Operate the filter, for at least a few hours daily or long enough to produce enough chlorine, with the salt chlorine generator. After the water temperature falls below 50°F, the salt chlorine generator may not be able to produce enough chlorine and you may have to supplement it with standard chlorine products. Being self reliant, so far as water testing, can help you avoid problems. The #2056 ColorQ PRO 7 Kit will test for free and total chlorine, pH, TA, calcium hardness and cyanuric acid. It is all digital, easy to use, eliminates all color matching and guesswork. The only thing it won't do is test for salt. Proper salt level is important for optimum efficiency and longer salt cell life. Salt PockeTesters provide several, all digital, easy to use options. Time spent over the winter, to make sure things maintained properly, will reap dividends, in the spring. I hope that this information will be helpful. ► Winterizing AGP With A Floatation Ball? Alan, I just discovered your web site and have been reading questions and answers about using the inflatable air pillow under a winter cover, for our above ground pool. Last winter we used one, but it did not help very much, the rain water accumulated all around the pillow and did not run off like you stated in several answers I read on your web page. I had to keep a submersible pump in it all winter and periodically go out and turn it on to remove the water. Maybe there are different size air pillows, I am not sure, but I am considering not trying to use one this winter. What could it really hurt? Thanks for your reply in advance. The purpose of using an inflated ball, underneath and above ground pool cover, is to allow excess water to run off. Besides all the normal winterizing steps, lower the water level to just below the skimmer or cover the skimmer openings with a winterizing sealing plate. You want the ball to raise the cover, well above the surface. The cover should lie on the water surface and some water should be added, to for a donut-shaped ring. This will help keep the cover from flapping, due to wind. Eventually, rain will fill this donut-shaped reservoir and the excess will over flow. Using a flotation ball should make things easier. In the spring, pump out the water and remove the debris, before attempting to remove the cover. I hope that this information proves helpful. ► Is A Cover Necessary? Alan, great site. I live in Albuquerque, NM - our average winter is about 40 degrees, sometimes snow, sometimes not at all. We have an in ground plaster pool with cascades, kidney shaped pool. Solar and gas backup heated. Is it necessary to winterize this pool by covering - I only ask because at the model home the pool company claims (and I remember it) that pool at the model was never closed. Opinion? Your winter conditions are not severe and you might be able to get away without covering the pool, especially if the pool filter is operational. To be sure check with local dealers or look at what other people are doing. A pool is an inviting hazard. Leaving it uncovered can entail some risk to children and animals. Have you ever considered a safety winter cover? There are several types available: automatic or manual retractable safety covers and mesh or solid safety winter covers. If nothing else, it will bring some piece of mind. I hope that this information will prove to be useful. If this website was helpful in providing information, please tell your friends and dealers. Alan, I am from Ontario Canada and this is my first inground pool closing for many years since I was a kid. I have heard and read about putting empty chlorine bottles in the water before putting on the liner. Is it recommended to do so? If so, why? Also, Is it recommended to take any parts of the heater, pump, or filter inside or are the O.K. stored and covered with a tarp for the winter. Once drained and antifreeze is added I thought they should be O.K. outside. The people we bought the house from last year only brought the salt chlorine generator into the garage, the rest was left outside and not covered. I think your website is great, thanks for the help. Having empty bottles floating on the surface acts as ice compensator and helps avoid freeze-thaw damage. While it is best to drain the equipment and store indoors, it is not always practical. Draining, adding antifreeze and covering is the next best thing. Disconnecting the salt chlorine generator and storing the cell and the controller indoors makes sense. If your pool has a built-in underwater light, it should be winterized according to the manufacturer's recommendations. Portable or add-on Underwater Pool Lighting Systems should be removed, drained and stored indoors for the winter. I hope that I have been helpful. Thanks for taking the time to read this. I would like to know how to close an in ground pool for the first time. My brother left me with the task and I am lost. He has a vinyl liner. How do I get the antifreeze into the lines going into the pool? Thanks. Make sure the pH is 7.2-7.6. Drop the water level about 3-6" below the skimmers. Disconnect the connections to the filter and pump and allow the water to drain out. Use a shop vacuum or air blower to blow out the lines. Afterwards, add some antifreeze to any lines that might have water at a low point. Use winter plugs on all returns. Store the pump indoors for the winter. If the filter can be stored indoors do so, otherwise drain and cover with tarp. Install plugs or a Gizmo in the skimmer intakes and returns. Seal off all exposed pipes, in order to prevent water from entering. Diving boards, slides, steps and ladders may have to be removed, in order for the cover to be installed. Store the equipment appropriately. Place an ice compensator in the pool, to help protect against freeze-thaw damage. Cover the pool and secure in place with strap, if present, if water bags. Place a cover pump, attached to a garden hose, in the center of the pool, if the cover is solid. This will be used to pump off accumulations of water. Your actual pool might require somewhat different steps. Refer the archives for additional information. Sit back and relax. When winter comes can spring to far behind? I hope that I have been helpful. Dear Alan, THANK YOU! My brother is still in Iraq and I was pulling my hair out. Believe me when I say you are a guardian angel. ► Leaving Pool Up And Running All Winter? Good day Alan. We are new to the GA area from Canada and this is our first pool. its in ground salt water with sand filter, liner. We want to close the pool and have no idea how to do it. The weather here doesn't get extreme cold. We don't want to put a cover on it but want to be able to clean it periodically for leaves at least until they stop falling. Do we need to keep the cell running? Like I said we have no idea what to do. If the weather was a bit warmer, I put the heater on and swim. Thanks. Not covering the pool and leaving the filter connected will simplify things. This is a reasonable option, in your area. Operate the filter and the salt chlorine generator, for a few hours a day. This will produce some chlorine and help distribute it throughout the pool. Otherwise, you will get algae growing, especially in the corners. Test the water once or twice a week. The pH will rise, due to the chlorine product, so acid will have to be added, s needed, based on test results. If the weather turns unexpectedly colder, to the point where a hard freeze is possible, keep the pump running during these below freezing periods. It will help prevent freeze-thaw damage. You should still removes leaves and debris, as it can lead to stains and will deplete the chlorine level. A Battery-Powered Leaf Vacuum is hoseless and cordless, for easier cleanup. Enjoy the holiday season. I live in Ohio, and have kept my pool open year round for years. Even after the gas bills prevented us from using the heater, the last few years, no problems. Well, the pump finally quit, and something broke, the water drained below the skimmers and then froze. Its about 1" in the pool, but floating, but supposed to get colder. What damage will I have If I just wait? Should I aim a space heater on the pump, valves, filter, etc. try to thaw the leak and repair it, replace the pump, and restart? The pump, filter, heater and valves are below grade, and when the leak thaws, the pool will start to gravity drain again, which will leave the pool ice hanging. Any help will be appreciated. If you do nothing, you will probably end up with freeze-thaw damage. Where and what type is unknown. Some damage could be in underground and inaccessible places. As long as you kept the water moving, you were OK. I see several options, but there could be more. If the pool is gunite and not in danger of popping out of the ground, perhaps you could just drain and blow out the lines and add some pool antifreeze to the lines. You could try and heat the pump area and insulate everything. It won't be easy! I would choose to replace the pump and prepare everything for a quick switch. Your weather prospects are not encouraging. Time is not your friend. In the future, I suggest that you consider a winter pool cover. What you were doing was costly and did not spare you from a major spring time cleanup. Good luck and let me know how it all works out. We replaced our liner last summer and the closing kit we used last winter had a floating chlorine canister that broke open during the winter and the tablets fell to the bottom. The liner is now bleached where the tablets landed. In this area the liner also looks like it is damaged, looks like small squiggly bumps all over the area. Is there something I can put on the liner in this area to perhaps restore the vinyl? The chlorine has permanently damaged to vinyl surface and, so far as I know, there is no solution. It is for this very reason that chlorine floats have been falling out of favor for thirty plus years. Vinyl liners cannot be exposed to prolonged direct contact of chlorine. There are lots of winterizing products and methods that do not involve chlorine tablets in a floater. If you're lucky, the damaged area might be able to be covered with a Graphic Pool Mosaic Mat. These premium weight vinyl mats really good like the real thing, but are simply dropped into the pool and positioned, with a pole. I hope that this information is of some help. I live in southern Texas. I have an above ground pool approximately 13,000 gallons. I am currently using biguanide, a non chlorine product. It is time to winterize and close the pool. Next season I want to switch to a chlorine product. The pool store has given me conflicting information about closing the pool. I know the water can not have any biguanide in it before I add the chlorine. One suggestion was to drain the pool, change the sand in the filter, and do a refill with chlorine. Would you do this now and then winterize or winterize with the biguanide and refill in the Spring? Maybe there is some complete other way to do this. Help if you can! Confused in Texas. I don't think that draining the pool is the way to go, as it could lead to liner shrinkage. Nor do I think adding more biguan ide makes sense. I suggest that you add 4 pounds of non-chlorine shock or 4 gallons of liquid chlorine, per 10,000 gallons. This will destroy the biguanide and allow you to convert to chlorine. The water will pass through a discolored stage, that will clear after the decomposition is complete. More chlorine or shock may be required. Check the Free Chlorine readings! Once the conversion is complete and a stable chlorine level has been established, you are ready to winterize as a chlorine pool. It would be best to replace the sand, but I would wait until next spring. Give some thought about adding a Salt Chlorine Generator, next spring, as it is the better way to do chlorine. After the initial investment, it is a lot less expensive to use, than is biguanide, Good luck and I hope that I have been helpful. ► Above Ground Pool Closing? This is my first winter with a pool. What should be done to prepare the pool? Thanks in advance. Proper winterizing will help protect your pool and equipment and make the springtime opening easier. Winterizing procedures can vary, depending upon equipment and circumstances. If in doubt, rely on the pool manufacturer's recommendations or consult your local dealer for assistance. Start by cleaning up the pool and adjusting the pool water chemistry to within the normal ranges. Remove ladders or steps. Boost the Free Chlorine to 5-10 PPM, by the addition of shock treatment. Lower the water level a few inches below the skimmers. Add winterizing algaecides and other treatments, as might be appropriate for your pool and water quality. Remove the skimmers and cover the openings with a skimmer plate. Drain the water from all lines and equipment. Store the equipment indoors or cover securely. Place a floatation ball or pillow in the pool prior to covering with a winter cover. This ball or pillow will help keep water from accumulating on the top of the pool and act as an ice compensator. Make sure that the winter cover is strapped securely in place, so as to withstand the winter winds and weather. I hope that this information will prove helpful. ► Solid Or Mesh Cover And Springtime Algae? Hi Alan, I am in the market for a safety cover, but am worried about the amount of sunlight coming through the standard mesh cover causing black algae growth in the pool. I was almost sold on getting a solid cover until a couple different sales people told me how heavy they are, and hard they are to put on. Do you know if the algae growth in the pool is significant enough, to warrant not going with a mesh cover? How hard is it to get rid of the algae? Does the algae ever totally go away? Thanks! Mesh covers tend to let small particles and waste to pass on through. It is just the nature of the product. But, it does keep the kids and pets safe and that is very important. However, they assure that the pool will be dirty when opened, because of the water getting into the pool. Algae is always present, in the environment, and will grow when conditions permit. Solid cover don't provide the same degree of safety, but are usually much less expensive. The solid vinyl one can be heavy and difficult to install. In addition, if they are put on and removed properly, you stand a reasonable chance of having an easier cleanup. Laminated covers are much lighter in weight and easier to install. More safety or the chance for less work? With a bit of effort and the right amount of chemicals, a springtime cleanup should be done in a weekend. Every pool and season are different. The more waste - the more chlorine will be required. You need to get a Free Chlorine level of 1-3 PPM established. Make sure that you end the season with a clean pool and an elevated free chlorine level of 5-7 PPM. Next spring take the time to remove the debris and/or liquid, from the top, before attempting to remove the cover. I hope that this will help you make the right decision. Our inground freeform pool and spa is less than one year old. The pool company closed the pool for us and just recently opened it. The pool and spa water was almost to the top of the brick coping. We have a mesh cover. All of the decorative ceramic tile going around the pool and spa were cracked, along the level of the water line. The opening crew indicated that the reason for the cracked tiles is because during the closing process, which the pool company did. The water level was not lowered enough to overcompensate for the rainfall and snow during the winter season. The pool company denies this claim and refuses to help fix the problem (even though we have a 3 yr warranty on the tile and coping in the contract). They have opted to blame the mason who poured the surrounding concrete, saying he did not put enough expansion joints. I have done some of my own investigating and found out that "If you have tile, and you do not lower the water level, then if water freezes, it can expand outwards and actually crack the tile." I am very upset and confused and would like some advice. What is your professional opinion on this? Thank you! The laws of chemistry and physics apply everywhere. Water, as it drops in temperature between 39°F and 32°F (4°C - 0°C) expands. Something has to give and it will not be the water. It would have been better to have placed ice compensators on the surface. An ice compensator can be most anything: foam noodles, empty plastic jugs, inflatable, etc. Anything that could absorb the compression forces. You can't keep the water out with a mesh cover and either the water level is well below expected rainfall additions or provisions have to be made to pump out excess water. This was preventable and you did hire "professionals." You should not have had to think this up on your own. Good luck with the resolution. I have an inground vinyl pool. After lowering water level below the skimmer and covering both pool and skimmer, water still gets into skimmer. How does this water get in? Shouldn't the cover be waterproof? I live in the northeast in freezing conditions. Will the Gizmo expansion device prevent damage to the skimmer, if water freezes in the skimmer? Is there any way to keep water out of the skimmer? Thanks. The cover is supposed to keep out the water. But, that doesn't mean that wind can not drive water under the cover or that some will not seep in through small leaks. A lot depends on the individual setup, conditions and how well the cover is secured. Winter plugs, that act as ice compensators as well, are available and are worth looking further investigation. I hope that I have been helpful. ► Salt Chlorine Generator In Uncovered Pool During Winter? Love your site but could not find answer to this question. I have a 15 ft. x 4 ft. above ground pool using salt chlorinator. I live in CA near San Francisco, not very cold in winter. Should I run the salt filter during the winter or use some other method or chemicals (I'd prefer the most natural way if possible) to winterize? Thanks! Salt chlorine generators will become less productive, as water temperatures drops to around 50 F. When it reaches that point, I would shut it off and rely of the use of standard chlorine products. Monitor the free and total chlorine 1-2 times weekly, during the chlorinator off period. Adding a dose of a 60% polymer algaecide, during this period, should help, as well. When the water warms to 55F, I would restart the salt chlorine generator and keep monitoring the free and total chlorine level, at least 1-2 times weekly. When the water is in the 60's test more often. If you stay on top of this, you increase the likelihood of having a algae-free pool. I don't recall the temperature question, being asked before, as regains winterizing, so I will be adding it to the archives. I hope that this information will be useful. ► Closing Above Ground Pool With Main Drain? Hi Alan. We bought a 21’ above ground pool in July 2011. We are using an ozonator system, with a 1 HP pump. We’re not exactly sure how to go about closing the pool for the winter. We would appreciate any help you can give us. PS the pool has a bottom drain. Is anti freeze an option? ABOVE GROUND POOLS WITH MAIN DRAINS ARE NOT COMMON AND CAN PRESENT A SPECIAL PROBLEM. I SUGGEST DISCUSSING PROPER WINTERIZING OF THE MAIN DRAIN AND LINE, WITH THE DEALER AND/OR POOL MANUFACTURER. Unlike an inground pool, the lines may not be below the frost line. Not everything applies to every pool. Thoroughly clean the pool and boost the free chlorine reading to at least 3-5 PPM. Add algaecide and other winter chemicals. Drop the water level about 3-6" below the skimmers. Disconnect the connections to the filter and pump and allow the water to drain out. Place an ice compensator or floatation balloons in the pool, to help protect against freeze-thaw damage and to raise the cover up so that water will run off. Cover the pool and secure in place with straps. Add some water, to the cover, to form a donut shaped ring, which will reduce flapping. Your actual pool might require somewhat different steps: discuss this with the dealer or manufacturer. Sit back and relax. When winter comes can spring to far behind? I hope that this information will prove helpful. ► Closing For The Long Haul? Alan, I need to close a pool for an extended period, possibly years. I am buying a house with a pool that I may never use but I guess I should preserve it for when I resell the house. It is reinforced concrete with a vinyl liner, 20'x40'. What are the options? Many thanks. This sounds simple enough. Years? Considering everything, it is not as simple as one might think. Yes, you can have the pool "winterized" to protect the underground pipes. Yes, lowering the water level to just below the returns should help protect the liner from shrinkage and the walls from collapse. Yes, you can add chemicals to the pool before covering, as a means of trying to maintain water quality for a period of time. In any event, even if the pool becomes a swamp, it usually cleans up. If you use a solid cover, you have to deal with water accumulations on the top of the cover. If you use a mesh cover, which is much better considering the circumstances, it will be difficult to keep any semblance of water quality over the long haul. A pool can be an inviting hazard. Given the circumstances, I suggest that you use a mesh safety cover, in the interest of safety. You'll have to deal with the water quality down the road. People have written me about pools that were left open and untreated for years. Safety should be your number one consideration. I hope that I have been helpful. #1- How low can I keep the pool water so I do not have to keep pumping it out? #2-Can the skimmer box be repaired again? #3-If so what is the best way so this does not happen again? #4-If not, how much do you think it would be to replace it? #5-Does the liner need to be replaced too when a new box is put in? I am not trying to be condescending, but I have never heard a good outcome story about an uncovered pool. At the very least, it will create more work in the spring. At worst, it a dangerous and inviting hazard. #1 For vinyl inground pools, in the frost belt, the water level is usually dropped to about 3-6" below the skimmers. This helps to keep any water, that might be in the underground pipes, below the frost line. #2 Possibly, the skimmer could be repaired, but I really don't know. #3 To better avoid the possibility of freeze-thaw damage, I suggest a winter cover. Prior to covering, the pool should be winterized and that includes, amongst other steps, lowering the water level to 3-6" below the skimmers, blowing the lines, plugging the returns, plugging the skimmer intakes and having an ice compensator in the skimmer. #4 Can't help on costs, as I don't know. #5 You should be able to replace the skimmer. Some types of liners may better facilitate this, but it should be doable. It is simpler, if the same skimmer type is used. Otherwise, it may require a larger skimmer or some patchwork. I hope that this information will prove helpful and convince you to use a winter cover. A proper winterizing will help make you look forward to the next springtime opening and not dread all of the springtime cleanup, associated with an uncovered pool. I hope that I have been helpful. We recently bought a house in upstate New York, and inherited a 24' above ground pool from the previous owners of our house. They did not care for it very well, had not covered it last winter, and didn't open it in the spring. So it took a lot of time and energy to open the pool when we bought the house in late June, and we were worried that permanent damage had been done, especially since there were numerous folds and wrinkles on the bottom of the liner. Last week we discovered the water level lowered dramatically; evidently the liner has sprung a sizeable leak. The liner is apparently at least 10 years old, maybe more, and so it should probably be replaced. Meanwhile, quite a bit of water has drained out beneath the pool, and I have no idea what kind of damage this might have caused. We will certainly need to replace the liner, and perhaps fix other damage besides, so we are considering selling the pool (sans liner of course) and cutting our losses. If we choose to keep the pool and replace the liner, is there any harm in removing the liner now and letting the pool structure stand without a liner for the winter? We would then put in a new liner in the spring. The pool has aluminum and maple plank siding. Thanks for all the fantastic advice on your site, and I appreciate any advice you can give! Best regards. Is there really a choice? With the pool leaking, you can't very well cover it. Without water there is no way to keep the cover from collapsing under the weight of all that snow you will be getting. I suspect that the pool will survive the winter without a problem. Just try any minimize the effects of accumulating snow on the pool walls and other structures. Make sure that all equipment is drained and protected and/or moved indoors. Good luck and I hope that I have been helpful. Hello Alan, I have a inground with a mesh cover. Well I went on vacation and was gone 12 days. When I came home I found out we had rain and a snow storm. Now I noticed my cover has a layer of ice on the whole cover. I think the pool must of filled up because the ice looks flat. Do I need to be worried? Its really cold here in Chicago and I don't think the ice is going to melt anytime soon. Any suggestions would be good. Also the pool is 16x32 with a liner. Thanks. Surface freezing in your part of the world in pretty much inevitable. Mesh covers are great for safety, but they don't keep the water out and it will rise over time, based on the rainfall amounts. If you took the proper winterizing precautions including, blowing the lines and/or adding antifreeze, sealing off the skimmer intakes, placing ice compensators in the skimmers and protecting the equipment, I don't think that you have a serious problem. It might have been a good idea to throw in a few of those "foam noodles" to act as ice compensators, in order to help protect the pool against freeze thaw damage. Did you follow the manufacturer's instructions? When conditions permit, I would pump down some water, if for no other reason than safety. You don't want it treated as a skating rink! I hope that I have been helpful. Thanks Alan for your quick response. I did close the pool for the first time myself, in the 3 yrs of having this pool and feel that I did it the right way. After going to your web site and reading it for about 5 hours, I got more help from you and your site than I did trying to talk to the people at 2 pool stores. This spring I will also open it myself for the first time and save money on opening and closing. The noodle idea is a good one. I will do that next year. Also, I heard different stories on draining the pool below the skimmer, some say you should and some say you don't have to. What do you think? Thanks. Draining the water level below the skimmer means more, if the cover is solid. In your case, water will get in. The important thing is that the skimmers be sealed off and that there be an ice compensator in each one. That way if the water rises above skimmer level, you should be protected. Stay warm! A year ago, we bought a house with an older inground pool. We had a new liner and propane heater installed. Last fall, we hired a "professional" to close the pool. He blew out the lines, added antifreeze and shut off the valves at the pump to keep them pressurized. I realized this spring that the heater has a warning on it that it should NOT be used as freeze protection and that two freeze caps should be removed. They weren't. The heater has been fine, but I think we just got lucky? This fall, we bought one of those tightly stretched mesh safety covers to use as a winter cover. Obviously, the water level will come back up with winter rains. Does that put our bottom drain main line at risk? One of the archives seemed to suggest that. Thanks. I don't know what you read or where, but the water in the main drain will not freeze. No way - no how! If Indiana, is where I think it is, just to the left of Ohio, the ground temperature at the level of the main drain is probably in the low-mid 50's - even in the winter. The pool will freeze over, but the ice will be only inches thick. Floating some ice compensators, on the surface, can help protect a vinyl inground pool from possible freeze thaw damage at the water level. Just follow normal winterizing practices and you'll be fine. The blowing out of the lines, sealing them off and even adding some pool antifreeze to the lines, is part of the recommended procedure. A suggestion, for mesh covers, from a visitor can be found in the online Pool Newsletter. It sounds like a good one. I hope that I have been helpful. ► Difficulty Blowing Out The Main Drain? I have had an inground gunite pool for 15 years and this year decided to close it myself. I can not "blow out" the bottom drain line, it is 9 1/2 ft deep. I have tried a 4HP wet/dry vacuum, and then went back and swapped it for a 6.5hp wet/dry vacuum (150 mph blower). I blew out my skimmer lines and return lines easily enough. I duck taped up the vacuum blower hose to the bottom drain line immediately before the shutoff valve. I ran the vac for 5 minutes and could not get any bubbles at the main drain. When the pool was open, I would sometimes close the skimmer line and water would flow up from the main drain so I know it is open and working. Now I'm considering a compressor but do not know what size to try. I know that they are measured in psi, can you tell me what I should consider? Thank you. Lowering the lines does not remove all the water from the main drain line. It only removes that which might be in a loop above the lowered water level. Drop the water level, 6' below the skimmer and add some pool antifreeze to the main drain line. With the water level in all lines, below the frost line, freezing should not occur. I hope that I have been helpful. Enjoy the winter. I have 28 ft round pool that is 5 ft deep. We had a center drain installed this year after pool was damaged by storm. and now I need to close it. We are going to blow air back thru line until we see air then close valve. Will this be sufficient to keep the center drain from freezing? Thanks for your advice. The water in the drain itself should not freeze. It is the line that is the problem. Filling the line up with air will work, so long as the air does not leak out! If that happens, water will enter and could freeze. Does the drain manufacturer or supplier have winterizing instructions, other that what you have related? Good luck and enjoy the winter. We are having our inground pool closed today and I need to lower the water level. We have a plaster pool. I drained the water to just below the skimmers in the Waste Mode, but then I lost prime and had to turn the system off. How do I continue to drain the pool? Thank you. If you have a main drain, close off the skimmers - setting the multiport valve to main drain only. It may be necessary to pour water into the pump basket to restore prime. If you don't have a main drain, you will need a supplemental pump. Get a submersible cover pump. You will be able to use it later to pump off water accumulations on the cover. Have a good winter. Thank you! I closed off the skimmers and was able to drain the rest of the water to 3-4 inches below the skimmers. We've had an awful experience with the building of our pool and I never seemed to be able to get my questions asked. I'm so glad I finally lucked upon your web site! Most of my questions have already been asked and answered on it! I've definitely put you in my Favorite Places! Have a great winter and I'm sure I'll be back in touch in the spring! Sincerely. ► No Winterizing And It's January? Alan, I am in the process of buying a house with an in-ground, gunite pool that was not properly taken care of this winter. I am trying to assess how much of a risk this is creating to the pool so that I can figure out whether I am at risk for a significant amount of money to fix the pool this spring. The water was not lowered enough below the skimmers level - in fact, last week, the water in the skimmers was frozen solid and the top inch or so of the pool was frozen. However, with the recent warmer weather in the area, the water in the skimmers has defrosted as has the water in the pool. I also don't think the pool was plugged, drained or winterized in any fashion. What possible damage may have been caused by this early freezing skimmers, frozen pipes, etc? Also, there is a spa attached to the pool. Thanks. What you have to worry about is what you can't see. If the underground pipes freeze and burst it may be quite involved in repairing them. Conceivably, part of the decking or walk-around area may have to be taken up. It is possible that no permanent damage has been done. I suggest that a pool professional dealer take a look at the pool. It may not be too late to winterize the pool, so far as the equipment is concerned. Water quality can be dealt with next spring. The important thing is to protect the pool! The seller should accept this responsibility. Good luck and I hope that it all works out for you. ► Blowing Out The Lines? You have mentioned time and time again, in the archives that the lines have to be blown out. Is there an easy way to do so, other than the use of a shop vac? A shop vacuum will work! You must have some type of pressurized air flow to blow out the lines. This is important in order to avoid freeze-thaw damage. Stop in and see a local pool professional. Perhaps, they can give you some practical advice, for your type of pool installation. ► Pool Closing With A Sand Filter? This is our first year of owning a pool. We have covered it, added chemicals, etc. Now we need to attend to the sand filter. Is it necessary to empty the sand out? We have heard conflicting information from various people. Please advise me on what to do. Unless your sand filter, specifically states that the sand must be removed, it should not be required. Typically, sand is not replaced more often than every several years. Just make sure that all the water is drained out of the filter and that the lines are blown out and sealed off, in order to avoid possible freeze-thaw damage. Protect from the elements and that's about it. Hope you enjoyed the season. ► Properly Protecting The Skimmers? We just bought a house in Southeastern PA, in January. We have been here a month. The in-ground pool has a good cover on it and, out of curiosity, I opened the two skimmer wells. They each had a plastic bottle frozen into the ice. I've read enough on your site to think that part is good. However, today I was able to remove the bottle and at the bottom of the skimmer well and there is a little black - maybe cap - with a screw and nut on it and then next to that is a little white cover which is NOT covering anything at the moment. I suspect this is very, very bad. We have had single digit/teen temps this year for a couple of weeks. Is there anything I can do at this point to help or am I pretty much guaranteed freeze damaged underground pipes? It sounds like the white cap is the cover for the skimmer line. This is used when vacuuming and serves no winterizing purpose. It would not be covering anything at this time. The black "cap" with the screw is a winter plug that should be sealing off the skimmer line. This line should have been blown out and drained. The plastic bottle was acting as an ice compensator, in case water collected in the sealed off skimmer. It would appear that the previous owner did what was required. At least that's what you should be hoping for. I hope that this information will prove to be useful and, somewhat, reassuring. Good luck with the house and the pool. ► Should I Or Shouldn't I Use A Skimmer Plate? 1) should I use a skimmer plate? I have heard that if you leave it open with hoses hanging you lose a lot of pool water from the weight of the rain, snow and ice. On the other hand, the skimmer plate increases the chance that freezing water will expand upwards toward the top rail. I live the CT so we share the same lovely winters. 2) should I continue to use an air pillow - what purpose does it serve? 3) last question, do you drain water off the cover or leave it there to hold the cover down. I asked 5 people and got 5 different answers so I decided to ask a professional. I appreciate your time! Thanks. I would use a skimmer plate. It will keep the water out of the skimmer and avoid possible freeze-thaw damage. Use the air pillow by all means. It raises the center of the cover and allows only so much water to accumulate on top. Thereafter, the water will run off the cover. If you use the air pillow and it raises the cover high enough, you won't need a cover pump. I hope that I have answered your questions. ► Winterizing The Return Lines? Hi Alan. Thanks for putting this help section up - very informative. My first pool is an old concrete pool 14x24 that was partly built by the original house owner in the 60's or early 70's. Pool structure itself is in good shape. I'm baffled that the return hoses going to the pool (the ones with adjustable eyes) are located very near the bottom of the pool in the shallow end (two of them) - there are none closer to the surface. Regardless, how do I drain these lines or do I need to? Should I dump a whole bunch of antifreeze in those lines in the hopes it will mix with the water? I'm in the north east with temps far below freezing. Thanks for your help Alan. I suspect that whoever, put the returns near the bottom was concerned about freezing. The pool bottom will not freeze - just the surface. Just pouring antifreeze in the lines can't hurt. It depends upon the configuration in the ground. Blowing the lines out and plugging before adding antifreeze, would be better. I hope that I have been helpful. During the pool season I use trichlor tablets in a floating feeder. Can I leave this in the water, after I close the pool? That way it can continue to release chlorine during the winter months. What do you think? I wish you would have told me what type of pool is being closed. At one time, winterizing chlorine floats were quite popular. The theory was that the feeder could continue to release chlorine, after the cover was placed on and would help keep the water in better condition. These floaters were used in above ground and inground pools, vinyl pools and masonry pools. Eventually, it was learned that all too often the floater was crushed by the freezing surface water and the tablets ended up on the bottom. In the case of a vinyl lined pool, having trichlor tablets on the bottom for prolonged periods of time will bleach the liner. In other cases, the floater ended up near the walls and caused a loss of color. The floaters also could damage the winter cover due to prolonged contact. After many pools, liners and covers were damaged, these products were phased out in favor of safer winterizers. Better to open a dirty pool than to risk a bleached liner! Back to your question. I don't think you should leave the floater in for the winter, no matter what kind of pool you have. There are lots of winterizing products available that should meet your needs, without risking damage to your pool, liner or cover. I hope that I have been helpful. We have an in-ground gunite pool. We had a new company close it and put on our heavy pool tarp. They did not put the tarp far enough from the edge of the pool, and the weighted bags used to hold the cover in place fell in and caused one end of the pool cover to submerge. All of the shocked pool water ended up flowing onto the cover (which is now submerged maybe 4 to 6 feet below the surface). The cover is loaded with leaves. Some leaves have fallen under the cover and are sitting on the bottom of the pool. How should this be remedied? Will this cause possible staining of the gunite? I would really appreciate your response. Thanks. You paid someone to do a job and they did not do it properly. The least they owe is an opportunity to correct the situation. That means the cover should be removed, the pool vacuumed and chlorine shock added to the pool. Leaves sitting on the bottom can leave tannins stains. Although these stains should be removed by the addition of chlorine, not treating the pool properly will lead to algae growth and a more complicated spring opening. They should be able to do this with a portable service vacuum and do not have to reconnect everything. I hope that this information will prove to be useful. Crushable things such as algaecide bottles or liquid containers can be used as ice compensators. They help provide protection against freeze thaw damage and water approaching the freezing point. The air pillows are used to help prevent water from accumulating on top of the cover. It also serves as an ice compensator. Sorry about the winter, but when winter comes can spring be far behind? ► Do I Need A Cover Pump? I'm a bit leery about leaving a pump hooked up all winter. Is it is necessary to have a cover pump? If you are using a "Cover Pump", it should be a pump that is specifically designed for that purpose. That is, it must be a submersible pump. Make sure that it is hooked up to a GFI protected outlet. The use of a cover pump is a good idea. It helps keep the accumulations on the cover to a minimum and reduces the possibility of a collapse of the cover into the pool. Having water accumulating on top of the pool could be an inviting hazard. Use the pump - you'll be better off next spring! Hi Alan, we live in central NY, and this is our first year with a pool (24' round above ground). I'm in the process of closing it, and my dealer tells me that I should add 6 gallons of "shock" chlorine (12.5% sodium hypochlorite) to the pool before closing it. My pool water has been fine all season - no algae, free chlorine maintained around 3ppm, pH about 7.4, and TA around 100. We did not have many swimmers this first year - our pool was not put in until late June, and it's just my wife and I taking a dip once in a while. My questions are these: I read the bottle on the chlorine, and I estimate that adding 6 gallons will increase the free chlorine to almost 60ppm (yes, sixty ppm!). That seemed ridiculously high to me, so I only added 2 gallons, and I estimate the pool (24hrs later) to be at about 22ppm now. Also, after adding the chlorine, it seems like that affected my pH, which looks to be about 8 now (also 24 hrs later). The TA still looks like 100, which is OK, I guess. What should I do? I hesitate to cover the pool because I'm afraid that the chlorine and the pH are both way too high. Any help would be greatly appreciated. Thanks! Your projected figures are probably correct based upon the theoretical, but it rarely works out that way. If your pool was in pristine condition before the closing, I agree that 6 gallons would be excessive. Such high concentrations could affect the vinyl liner's color, over the course of the winter. Liquid chlorine has a very high pH and it is normal for it to raise the pH of the water. A 5-10 PPM free chlorine level and a pH of 7.2-7.6 would be preferable, in my opinion. I suggest that you confirm the true Free chlorine reading and not rely on a estimate. High chlorine test results can be best measured by many methods. However, a ColorQ all-digital Water Analyzer would be an ideal choice. I hope that I have been helpful. After blowing out my lines, I split 2 gallons of pipe-line antifreeze between the intake and return lines. I live in a cold place and I feel better about the added protection. My question is can I use an automotive antifreeze, instead of the type the local pool store sells? Thank you. The problem with using an automotive antifreeze is that the product will end up in the pool water. The concern is not necessarily with the toxicity of the material because it will be diluted down many thousands of times. The problem is that the automotive antifreeze, usually ethylene glycol, can react with the chlorine and form chlorinated hydrocarbons and it is these byproducts that you want to avoid in swimming pool water. I suggest that you stick with a reliable brand of swimming pool, pipe-line antifreeze and use it as directed. Enjoy the winter. I hope that I have been helpful. I have been a pool owner for more yeas than I want! My first pool was concrete/gunite. For winterizing I used good OLD AUTO ANTIFREEZE, diluted 50/50. I now have a vinyl liner pool and much larger, 45,000 gal and would like to use "Good Old Antifreeze" again. One company used 50 gal of antifreeze and I got rid of them. Would this be a problem with the vinyl liner? Since the Pool guys want $14.00 a gal for the super non toxic antifreeze and the pool is so many gallons, this would cut my cost of closing substantially, by providing them the antifreeze and dilute 50/50 again. Closing in 2 weeks, please let me know. Regards. Automotive antifreeze is not recommended, even if diluted 50/50. Apart from its toxicity, it can react with pool chlorine and form unwanted chlorinated compounds. Use a pool formula antifreeze or a propylene glycol based product. It is unnecessary to complete fill the lines. Blow them out and add some antifreeze, no more that 1-gallon to each line. This will mix with any residual water and provide adequate protection, so long as most of the water has been blown out. I hope this information proves helpful. ► Water On Top Causing Problems? Live in the Detroit area, and as you know we had a fairly wet winter. I tried getting all of the water off I could, but now there is a lot of ice. I have found that the cover is really tight and pulling in a couple of walls. I released the tension in the cable for the cover, but is there anything else I can do? Did you place a large ball or pillow under the cover? This would have raised the cover, in the center, and allowed the water to run off. This will minimize the amount of water collecting on top. Most pool dealers carry, or should, something suitable. Is it possible that the pool has lost some water? Would a cover pump allow you to remove some water? Things being frozen, as they are, really doesn't leave many options. Good luck and I hope that I have been of some help. ► Trying To Protect The Liner? Our pool has had 5 winters and this last we had a record amount of rain and lots of water under the liner. We separated a 4 foot section from its track and keep the pump in for months and I would watch it daily to see how long was needed to pump out the water. I read an answer you had to a question on 1/8/05 and it made me wonder if I am understanding what you said, is if we didn't drain the water our normal 2 inches below the skimmer which amounts to a total of about 8 inches total in depth for our pool would the vinyl not shift? Our pool is 16x32 with a deep end and a main drain. We live in Albany Oregon. It was hard to put the vinyl back in its track, because of new wrinkles from the shifting. Thanks. The floating liner problem is less likely to occur, if the water level is higher. You can plug the skimmers and add an ice compensator to each one. That will allow you to keep the water level high. Add some foam noodles to the pool and they will act as ice compensators. That leaves the main drain line and possibly the others. You are in Oregon and not Alaska. The frost line is relatively close to the surface. If these lines are below the frost line, they will not freeze. The water level in these lines should be the same height as the pool. How far below ground level is the pool level? If you drop the water level below the skimmers and blow out these lines, before sealing with the winter plug and restoring the water level, these lines will be less of a concern. Blowing the other lines will help remove water from any loops that could be closer to the surface. This is your call. I would think that the pool will be OK, but I don't have all the facts or a complete understanding of your location or weather. Good luck.